Danly DieMax™ XL Die springs are manufactured in lengths, diameters, and load classifications that conform to the ISO 10243 International Standard and the NAAMS (North American Automotive Metric Standard). The specification includes color coding of each spring for load identification. ISO 9002 registered quality means that these springs are manufactured to ISO 9001: 2008 quality standards consistent with the DANLY reputation. The coils are a spring quality chromium silicon alloy in accordance with ASTM A1000-99 specifications. The coil cross section is a "D" shape which is exclusive to Danly. This is the extra heavy load series that provides the greatest force and has the shortest travel to solid. The color code is yellow and there are 99 standard sizes. 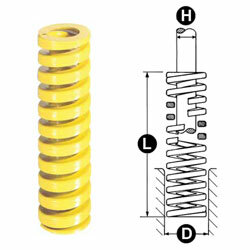 There is another series of Yellow Metric Danly ISO Die Springs. Those are the same as these inch springs with the exception that the springs' dimensions and loads shown in the catalog are converted to metric units. The available major diameters (D) are 3/8 to 2-1/2 inches. The available length (L) are 3/4 to 12 inches. Please contact us if you need a different size, or if you need us to make any alterations. From Jack Wilhelmson of Mount Pleasant, South Carolina on 12/30/2017 . very high quality product. I have used these springs for over ten years.